We are very pleased to present our first team mapping effort by Team Lamb Chop! For their map and presentation they won the much coveted "What the hell is that? ("Sheep Dip" aka we don't understand it either)" trophy from IronSheep 2012. We'll let their words speak for themselves (although we might offer a bit of commentary in the footnotes). 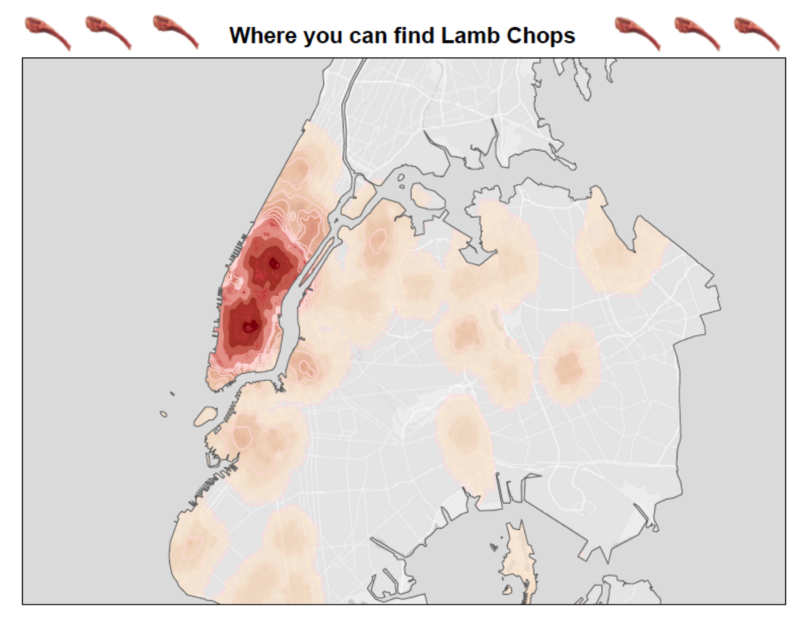 Given that our team name was Lamb Chops, we wanted to see in which New York neighborhoods one would have the best chance of finding lamb chops on the menu. Our hypothesis was that, given a catastrophic event such as a meteor strike, tsunami, or Godzilla attack , lamb chops would be the preferred post-apocalyptic food of New Yorkers and visiting tourists. Based on the data mined from Google search results for "Lamb Chops" derived via PerlScript, we were able to locate the neighborhoods in which this tasty treat was most prevalent. Our analysis included all Google hits within 0.5 miles of the centroid of each ZIP code in New York City, save Staten Island, which presumably would be engulfed first by tsunami waves and/or seized by the Wu Tang Clan in a last-ditch attempt to create a utopic settlement called Wu York City . Our results were then mapped using IDW interpolation. Our conclusion was that the Hilton on 53rd Street and Union Square would be the two best places to savor one's last lamb chops before the world ended. Not to be confused with this lamb chop. Seems like a highly reasonable hypothesis, yes? Because nothing gives you the munchies like the complete collapse of civilization. On the plus side (for tourists at least) getting a room in Manhattan probably would be easier post-apocalypse. Which will also re-release a version of their earlier work as S.R.E.A.M. (Sheep rule everything around me).